Our beautiful cup base trophy comes with a gold textured cup and a default cherry base. If you would rather not have a cherry base you can select a different color base. We offer four base options which you can select from above. This elegant award has an overall height of 16 3/4" to 18 3/4" depending on the figure and cup you choose. The height of the lid & cup combined are around 10 1/4" tall. Our cup trophies come completed with a gold plate and 40 characters of free printing. You can specialize the trophy by adding your logo in the printed area of the trophy. If you want to add your logo you can email it to us in a jpg file. If you don't see your dog breed, call us, we can get most breeds or send your own image or clip art preference. We have different size cups and bases if you need to put a placing set together. These cup trophies have different price breaks the more you order! 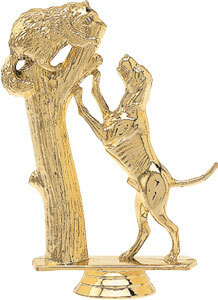 Dog trophies are shipped within seven business days. (A very large event may take a little longer) Standard shipment is UPS ground, however, we can UPS air or USPS if needed. If you need the order sooner, we can add a 15% rush charge to the order. Special shipping and rush orders must be confirmed by phone 1-800-787-8777. If you have any extra printing charges they will be e-mailed to you. The store invoice will not show the extra charge. Business hours are 8:30 am to 4:00 pm central time. Orders can be placed online anytime, at this safe and secure store. Please take a few minutes and check out all our dog awards.